Member for Barwon, Kevin Humphries today congratulated local midwife Boe Calvert on being named the best Midwife in NSW, at the 2018 NSW Health Excellence in Nursing and Midwifery Awards. The announcement was made at the NSW Health Excellence in Nursing and Midwifery Awards at a gala event at Parliament House in Sydney, last night. “To have one of our midwives from a remote area recognised as the best Midwife in NSW is a remarkable achievement. Well done Boe, you have made Far West LHD and those living in the remote area of Far West NSW, so very proud,” Kevin Humphries said. Boe was awarded the Excellence in Midwifery – Registered Midwife award and was congratulated by the Far West LHD for her amazing achievement. 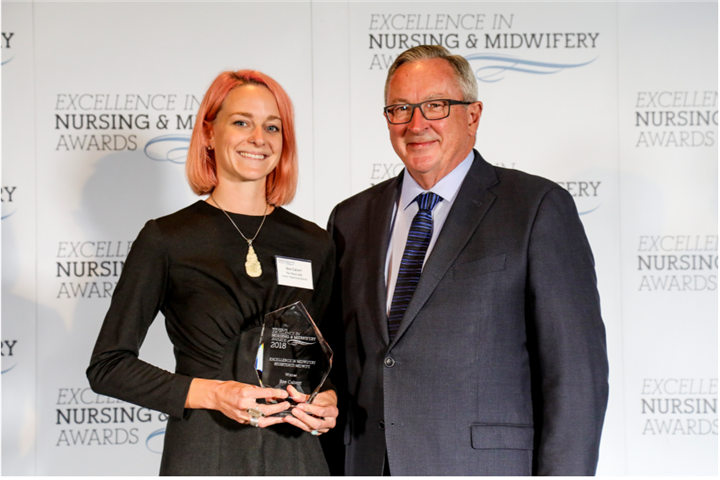 Excellence in Midwifery – Registered Midwife winner Boe Calvert – Broken Hill Health Service FWLHD, with Brad Hazzard, NSW Minister for Health. “We are ecstatic and are over the moon for Boe. To have one of our Broken Hill midwives named the best in the state is amazing and we are very pleased Boe has been recognised with this very prestigious award,” said Ms Dale Sutton, Executive Director of Nursing and Midwifery, Far West LHD. Boe was nominated for the award in recognition of her caring and gentle work as a midwife at Broken Hill Health Service. She works in partnership with women and their families and is passionate about improving maternity care for Aboriginal women and families in rural communities. Boe has been proactive in improving collaboration between maternity services at Broken Hill Hospital and Maari Ma through relationship development. She provides invaluable support, education, encouragement and guidance to junior midwives to ensure that safe clinical care of the highest standard is provided in high-risk situations. She has proven herself to be a skilled, competent and knowledgeable midwife, who continues to seek opportunities for professional development to achieve positive outcomes for the women and their families she provides midwifery care for. Boe was also a joint winner of the 2018 Far West LHD Excellence in Midwifery – Registered Midwife Award. She has been employed as a Registered Midwife in Far West LHD for over 12 months. The NSW Health Excellence in Nursing and Midwifery Awards recognise and publicly acknowledge nurses and midwives for their excellence in practice and for the significant contribution they make to their professions, their teams and the community. NSW Chief Nursing and Midwifery Officer Jacqui Cross said the awards recognise nurses and midwives who have demonstrated excellence and commitment to improving patient care. “The awards celebrate the difference that individuals can make to the experience of care for patients, families and the communities in which we work,” she said. A record 52,000 nurses and midwives work in the NSW public health system, with more than 2,400 nursing and midwifery graduates recruited in 2018 – over a quarter for rural and regional areas. NSW Health Minister Brad Hazzard thanked the winners and 23 nominees. “This is an opportunity to recognise the many men and women across our health system who consistently do such a fantastic job, providing the best possible care to patients, every day,” Mr Hazzard said.